How does meditation work? I’m sure there are loads of scientific papers and sutra commentaries on the subject but I have one mundane theory I’d like to share. We all self-talk all the time. I find it hard to believe the occasional person I meet who claims they don’t. The problem with this is two fold. Firstly listening to the same person drone on can be become boring even if they are our favourite person and very few people are their own favourite person. Secondly to talk continuously requires a vast amount of material. That voice in your head soon runs out of things to say and loops back around on itself. This can reach a point of illness if the thoughts are particularly depressing or anxiety inducing. There are strategies we use to deal with “the voice” and they can be used in combination. Distraction is good. Watching a movie or listening to the radio enables us to skip along on someone else’s voice for some light relief. Additionally we are blessed with context-dependent memory. This is the mental mechanism that partially wipes the mind as we move from one scene to another. It is useful when you don’t want to think about work at home but a pain when you forget what you came in a room for. We use context-dependent memory in combination with external triggers to repeat our self-talk narrative without getting too bored. So what happens when we sit on the same cushion in the same room day after day to meditate? Same context, no distraction, same self-talk, nowhere to hide. At first there are the issues of getting to know and like the person who does the self-talk and that can take years but after a while we begin to see past it and deeper into the un-narrated self. Meditation is dropping our stories. My practice isn’t sitting on the cushion so much but walking across a city. Plenty of distraction. Many changes of context. It should be ideal support for self-talk. This is where the Pointless Pole comes in. It has been there for years and I’ve been walking past it for years. I don’t recall there ever being a sign on it but hope it has been used to hold things up in the past. 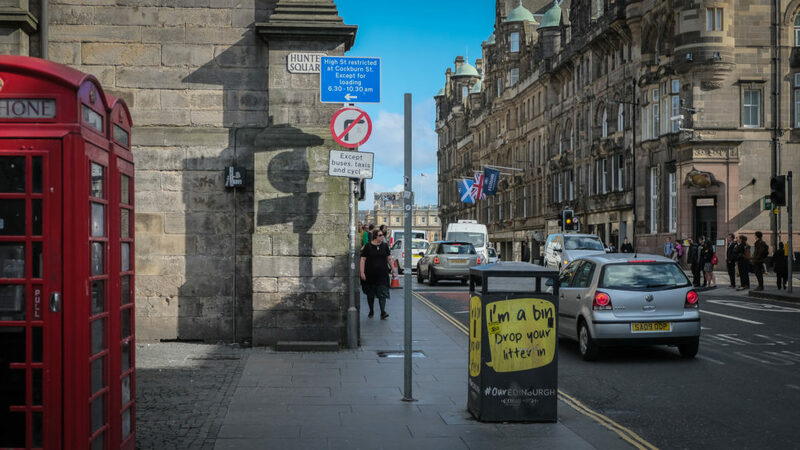 It is positioned for maximum inconvenience on a narrow stretch of pavement by a busy road next to the Royal Mile – one of the biggest tourist attractions in Scotland. Could “they” not have at least put it inline with the **** bin?! The first time I really noticed my self-talk repeating here was the use of the word “they”. Every time I would say “Why did they put it there?” But I realised I didn’t know who they were. The workers, the council, the enemy, just not me. I started trying to say to myself “Why did we put it there?” after all it was a collective action of the society. But then I started repeating that, I’m so clever, story every time I saw the pole. Then I realised I was repeating it and that became the story. There are numerous places along my route (which I hardly vary) that trigger stories that I recognise, say “Hello story” then go back to my breathing and my steps and being open to my experience of the city not distracted by it. The Pointless Pole is just, perhaps the king of my mindfulness triggers. My current story for the pole is about impermanence. I’m sure once I’ve written this someone will move the pole or perhaps put a sign on it. 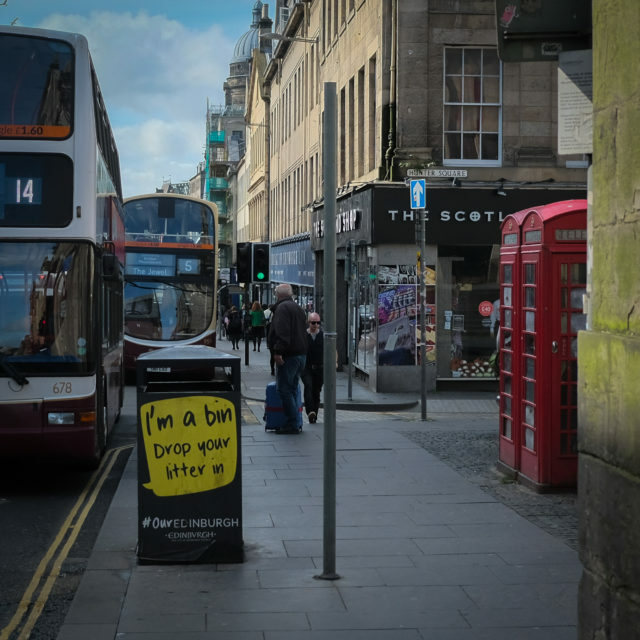 If you are in Edinburgh why not go on a pilgrimage to see it?